​Alcoholics Anonymous® is a fellowship of men and women who share their experience, strength and hope with each other that they may solve their common problem and help others to recover from alcoholism. The only requirement for membership is a desire to stop drinking. There are no dues or fees for AA membership; we are self-supporting through our own contributions. AA is not allied with any sect, denomination, politics, organization or institution; does not wish to engage in any controversy, neither endorses nor opposes any causes. Our primary purpose is to stay sober and help other alcoholics to achieve sobriety. Only you can decide whether you want to give A.A. a try or whether you think it can help you. We who are in A.A. came because we finally gave up trying to control our drinking. We still hated to admit that we could never drink safely. Then we heard from other A.A. members that we were sick. (We thought so for years!) We found out that many people suffered from the same feelings of guilt and loneliness and hopelessness that we did. We found out that we had these feelings because we had the disease of alcoholism. This website was created as a joint effort between Area 24, District 1 and Siouxland Intergroup. This website is copyrighted 2010. All rights reserved. ​712-252-1333 or email us aacentralofficesc@gmail.com. Did you know that our Central Office carries AA and Grapevine literature??? 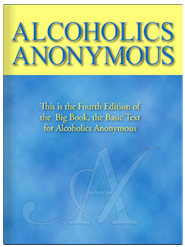 We have the Alcoholics Anonymous "Big Book", Twelve Steps & Twelve Traditions" plus a whole lot more! Call us or stop in for all of your AA and Grapevine literature needs. ​Participate in the Birthday Plan! Click here for the Grapevine Quote of the Day! ​​​** The Central Office DOES NOT carry Birthday/Anniversary Coins/Tokens. We have been informed that the 4 local club houses as well as many Groups have Chips/Tokens for sale.